Google has published a new report detailing how it’s dealing with spam, bots and other problematic “ads” on its network. 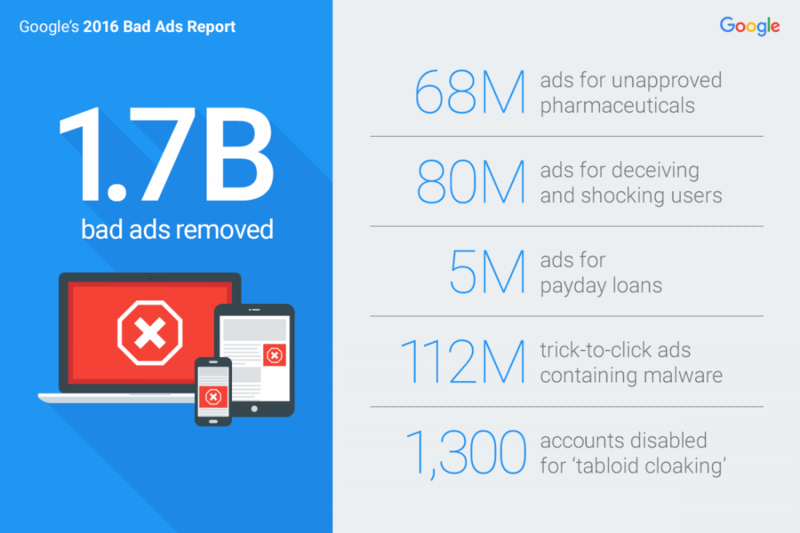 According to the company, it took down more than 1.7 billion ads that violated its policies in 2016, more than double the 780 million bad ads it eliminated one year ago. Google took down 524 million in 2014, 350 million in 2013, and 220 million in 2012. The search giant credited a couple of things for the big increase in removed ads. For starters, it expanded its policies for ads that don’t meet its approval criteria — it banned payday loan ads, for instance, disabling more than 5 million of them by year's end. The company also targeted ads for illegal products as well as misleading ads for things like miracle weight-loss supplements. Second, it improved its technology to more effectively discover and disable unwanted ads or ads that try to game the system. Among these bad actors are “trick to click” ads that look like system error notifications to get users to download malware — Google says it caught 112 million of them, six times as many as in 2015. It also detected more “self-clicking ads” on mobile devices and tabloid cloakers, a new type of scam ad that tries to game the system by pretending to be news, taking advantage of timely topics — a government election, a trending news story or a popular celebrity — to take you to an unrelated website. And in that same vein at a time when fake news is becoming a legitimate concern, Google says it reviewed 550 sites suspected of misrepresenting content to users and impersonating news organizations, taking action against 340 of them including 200 permanently banned publishers. Google of course makes virtually all its money from advertising and while banning millions of ads might sound counter intuitive, it’s in the company’s best interest to improve the quality of the experience for the benefit of the online advertising industry as a whole.